Neighborhood in Brief: Some of Chicago's most exciting neighborhoods thrive just on the outskirts of downtown. In these areas, you'll spot more locals than visitors, yet all are welcome. The West Loop's one of those areas and is comprised of Fulton Market, Randolph Street Restaurant Row, River West and an actual pocket called the West Loop. The neighborhood's also home to some of the city's most revered art galleries and nation's hottest chefs, such as Grant Achatz, Stephanie Izard, Paul Kahan, Curtis Duffy, Sarah Grueneberg and Bill Kim. 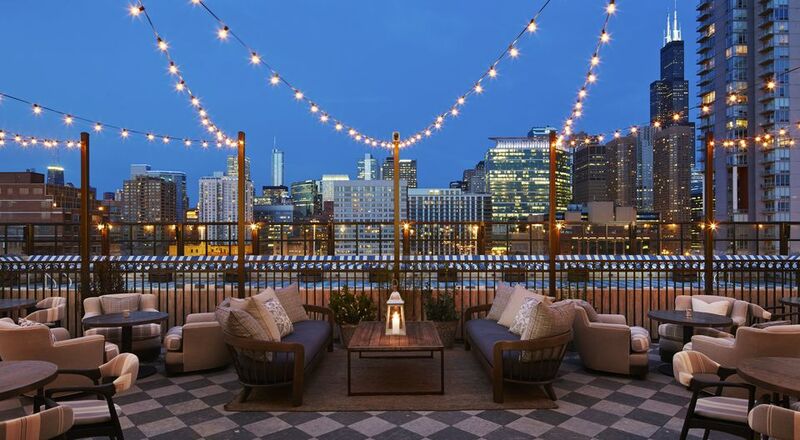 Soho House Chicago in Brief: The London-based hotel group opened its first property in the Midwest in 2014. Soho House takes over a six-floor historic warehouse dating back to 1907, the original manufacturing center of the Chicago Belting Factory. There are 40 guest rooms and suites. Amenities: Membership-only amenities include access to the Drawing Room (a day-to-night meeting space), Club Bar (gastropub for all-day eating and drinking), seasonal Italian eatery, screening room, Belt Room private dining room, and a rooftop equipped with a 60-foot swimming pool with alfresco dining, drinking and views of downtown. Members and hotel guests also have access to a 15,000-square-foot gym. Its amenities include: a professional boxing ring, Technogym equipment, two fitness studios, men and ladies lounges, and steam rooms. Cowshed spa specializes in facials, massages, waxing and body therapy. Room Rates: Rooms range $223-$489 a night. Parking: Street parking is available, but scarce. The hotel offers valet parking. Momotaro in Brief: The stylish Japanese concept is from the Boka Restaurant Group, which is also behind Boka, GT Fish & Oyster and Girl and the Goat. To allow guests to get an authentic experience of how they've updated traditional Japanese fare, Momotaro's chefs feature small plates that are broken down into six sections (snacks, cold and warm appetizers, rice and noodles, salads and soup, from the coals and grilled skewers). They also specialize in fish selections that you'll likely not find anywhere else in the states. The beverage menu focuses on Japanese beer, spirits, wine and cocktails with Japanese accents. Aviary/The Office in Brief: When it comes to cocktail lounges, Aviary’s in a class by itself. The award-winning watering hole is the brainchild of molecular gastronomy master Grant Achatz, and the drinks follow a similar culinary philosophy. Bartenders, in fact, are dubbed “sous chefs” and arrive several hours before opening to prep ingredients. The results are magical, with fresh perspectives and seasonal renditions of classic cocktails such as the Manhattan, Champagne cocktail and Old Fashioned. Directly underneath Aviary is The Office, a tiny, invite-only space that seats about 18 guests for drinks and small plates. Both bars boast a massive whiskey list with rare scotches and bourbons as well as progressive whiskey flights. City Winery in Brief: The is the second outpost of the New York City-based urban winery. In addition to holding the title as the city’s only fully operational winery, the sprawling venue serves as a restaurant, live-music venue and retail store. The massive 33,000-square-foot structure exists as several entities: a fully operational winery, 300-seat restaurant, concert hall, retail store and wine bar. The wine-making component is situated in the rear and available for regular and private tours. BLVDier in Brief: Clothier fitter Zach Uttich wants to make custom-designed suits more accessible. His stylish, yet understated shop in Fulton Market District opened in 2015 to offer men quality suits, shirts, trousers and more at reasonable prices. For example, BLVDier's half-canvassed suits start at $825 and fully canvassed suits at $895. Clients may also choose from 40 different buttons and 120 different linings alone.